BIG BEAR LAKE – R.J. Robinson, president of Old Miner Association, Inc. announced executive board members of the association. To serve with the new president will be Keith Franks, Bank of California manager, vice president; Arra Moon, secretary; Douglas Hooper, treasurer; John Kurlander, finances; and Gene Lyon, coordinator. 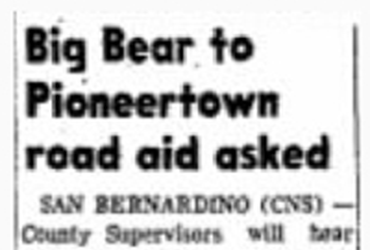 Most important of resolutions brought before the board was a decision to hold the burro derby in Bear Balley, pending securing a final commitment on one portion of the race. All others were settled prior to the meeting. 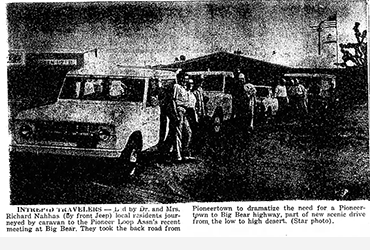 In former years the race has started on the desert in either Apple Valley or, as in 1965 from Pioneertown. The resolution was passed unanimously in the belief that visitors can be better entertained during the celebration by keeping all activities in a concentrated area. 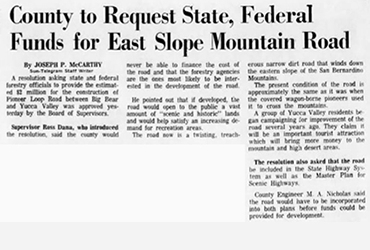 Named as parade committee chairman was Tom Boring; burro race chairman, Bob Schiller, with special race adviser, Dennis Bullard; Robert Freeman, publicity; and Dallas Schiller, fire control. Unselected as yet are chairmen of special events and dances. Betty Jackson accepted the Miss Clementine Fashion Show post. Col. Bud Reynolds will serve as timekeeper on the race.